This base is inspired by a lamp produced by the Omega Workshops in 1913. This base is inspired by a lamp at Charleston Farmhouse. The cylindrical base is reclaimed pine. These bases are ‘found’. They are stripped, handpainted and rewired. All shades featured on this website can be bought individually. The shades are handmade from bookpaper which gives the exterior a canvas-like texture for painting. The interior is lined with card and is washed to enhance the depth of colour when the lamp is lit. I paint two shapes of shade: Empire and Coolie. Pendant fittings for ceiling shades are also available. The size of shade refers to the diameter at the base. I hold sizes 8” to 24” in stock. Please phone for details. The prices given are intended to give an idea of price range for each design. I paint ‘found’ pieces. I collect interesting items of furniture, doors, trays… in fact anything made of wood. I also paint pieces owned by the client or can offer custom-built furniture made by a cabinet maker (of 30 years experience). 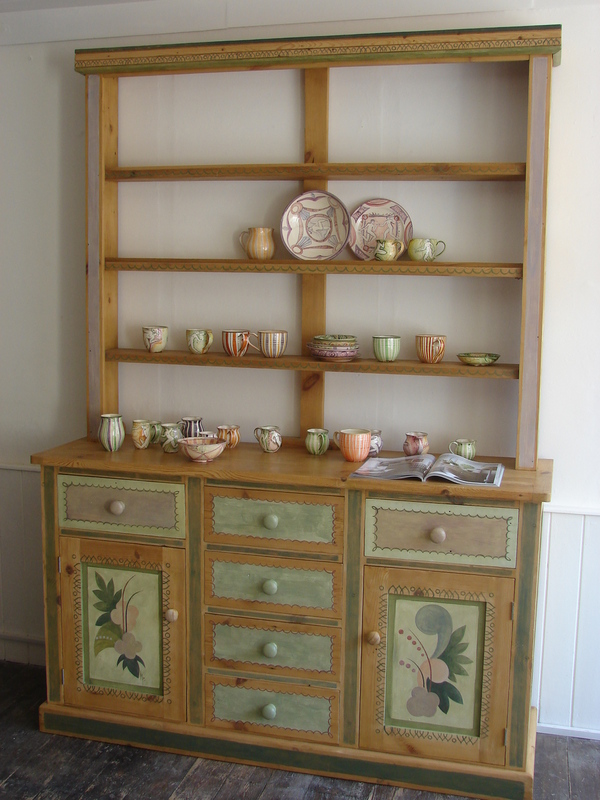 Painting furniture almost always involves collaboration with the client, so, if you have an idea please get in touch.